Shawarma without a spit? Hummus in five minutes? Chef Michael Solomonov’s new book, “Israeli Soul,” brings the foods and flavors from Israel’s stalls, markets and bakeries to home kitchens everywhere. WASHINGTON — Michael Solomonov knows Israeli cuisine. The Philadelphia-based chef is a three-time James Beard Award winner, and is well-known for bringing a taste of his birth country to the East Coast with his flagship restaurant Zahav. But Solomonov’s latest project skips the restaurant kitchen entirely: His new book, “Israeli Soul,” brings the foods and flavors from Israel’s stalls, markets and bakeries to home kitchens everywhere. 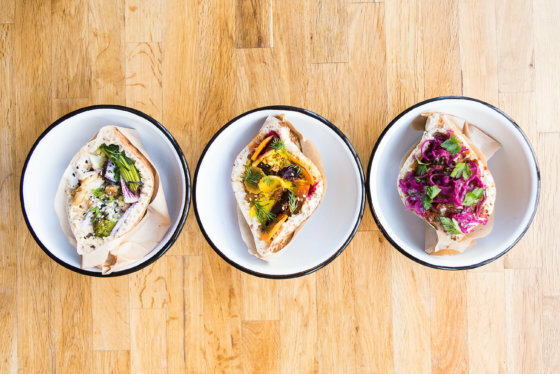 At D.C.’s newest fast-casual spot, the popular chickpea spread has been called off the sidelines, and instead, is the star of each meal. “I think the American diner is really excited for new things, and from a gastronomic perspective, (Israeli cuisine) is really exciting and stimulating,” said Solomonov, who explained that Israeli cuisine is a blend of European, Middle Eastern and North African ingredients, flavors and traditions. For the book, Solomonov and his co-author and business partner Steven Cook ate more than 80 meals over an eight-day trip to Israel. A combination of spices, some slicing and searing turn a roasted lamb shoulder into the street-vendor classic, shawarma — no rotisserie spit required. Canned chickpeas and a ton of tahini are the tricks behind Solomonov’s smooth and creamy five-minute hummus. “I think that’s sort of the measure for everything, right? You can make anything, provided you have the time for it, but to set aside five minutes of time to make really good hummus with barely any cleanup is, I think, the ideal,” he said. POTATO-LEEK LATKE is excerpted from ISRAELI SOUL © 2018 by Michael Solomonov and Steven Cook. Photography © 2018 by Michael Persico. Reproduced by permission of Rux Martin Books/Houghton Mifflin Harcourt. All rights reserved. Mix together the potatoes, leeks, flour, and salt in a large bowl. Set aside for 10 minutes to allow the potatoes to release some starch, which will help hold the latke together. Pour about ¼ inch of canola oil into a medium skillet and place over medium- low heat. Make one big pancake by spooning the batter into the skillet and pressing it down evenly in the pan. Fry for 10 to 15 minutes per side, or until cooked through and crispy on the outside. Let cool slightly, then cut into wedges. FRIED CHALLAH SUFGANIYOT is excerpted from ISRAELI SOUL © 2018 by Michael Solomonov and Steven Cook. Photography © 2018 by Michael Persico. Reproduced by permission of Rux Martin Books/Houghton Mifflin Harcourt. All rights reserved. Combine the sugar, yeast, and water in the bowl of a stand mixer fitted with the dough hook. Let stand until foamy, about 5 minutes. Add the flour, salt, olive oil, canola oil, and egg yolks. Mix on low speed until the dough comes together and begins to pull away from the sides of the bowl, about 1 minute. Gradually mix in the butter, mixing for another minute. Scrape down the side of the bowl and continue mixing for 2 more minutes. Cover the bowl and let the dough rise at room temperature until it has quadrupled in volume, about 4 hours. Fill a large pot with a generous 2 inches of canola oil. Heat over medium heat until the oil registers 350°F on a candy thermometer. Line a baking sheet with paper towels. Use an ice cream scoop to drop balls of dough into the hot oil, adjusting the heat as necessary to maintain the oil temperature. Fry the donuts in batches until golden, 4 to 6 minutes. Remove from the pot with a slotted spoon to drain on the prepared baking sheet. Let cool slightly. Combine the sugar and crushed rose petals in a shallow bowl. Poke a hole in each donut with the tip of a paring knife. Spoon the jam into a large resealable plastic bag, press out the air, and twist the top until the bag feels tight. 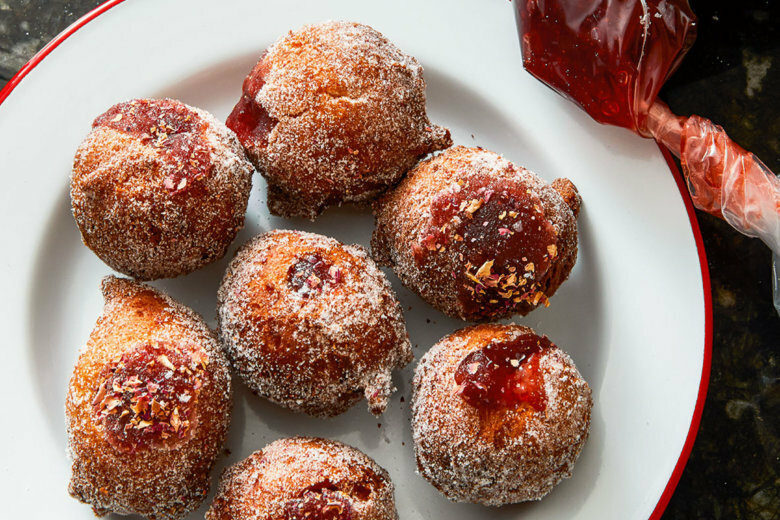 Snip off a corner of the bag and squeeze the jam into each donut until a bit oozes out. Roll the filled donuts in the rose petal sugar. Serve warm.